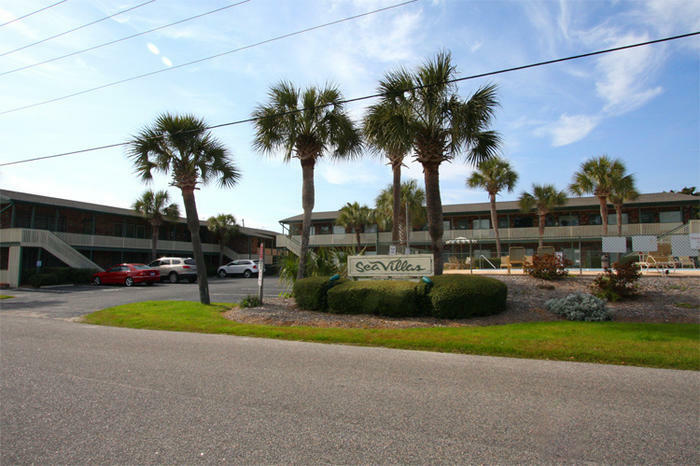 Sea Villas is a private vacation resort in the Windy Hill section of North Myrtle Beach, South Carolina. These beach themed rental condos are a great starting point for your vacation. The resort is located just moments from the Atlantic Ocean, and the rental condos are well provisioned for your stay. Each rental condo has one bedroom and one bathroom, and accommodates up to four guests. The unique décor says you have arrived at the beach, and it is time to vacation! Each condo has its own washer and dryer and full sized kitchen. You can easily prepare a meal or snack, and enjoy it at the table, or on one of the countertop stools tucked away for quick on-the-go use. There is a window air conditioner to cool you off after your full day of North Myrtle Beach, South Carolina sun. There is a flat-screen TV to relax in front of in the evening. Sea Villas offers great amenities to occupy your time at the resort. There is an outdoor, eight-foot deep pool with lounge chairs on the pool deck all set up for a day of splashing and sunbathing. Since this is a lower density unit, you will have more room to spread out and feel at home. There is a grill area provided at Sea Villas in North Myrtle Beach, South Carolina, so if there is a grill master in the family who likes to dazzle everyone with culinary skills you are ready for action. The grounds are beautifully landscaped with palm trees, setting the tone for a tropical vacation from the moment you spot Sea Villas. The beach areas in North Myrtle Beach, South Carolina are within moments of your rental condo resort entrance. Just a short walk or ride will have your feet in the sand and your face turned up to the sun. North Myrtle Beach, South Carolina is located on the 60 mile stretch called The Grand Strand, which has a well-earned reputation for some of the most beautiful beaches in the world. Put on your swimsuit, grab a beach towel, and pack your beach bag with your beach-going equipment. As you depart Sea Villas, don’t forget your picnic lunch, drinks and tunes, because you will have a hard time pulling yourself away from the beach once you get there! What could be better than a day filled with sandcastles, seashells, and playing in the Atlantic Ocean? Unless maybe it is a day filled with swimming, boating, golfing, shopping, and all the other activities so close at hand in the North Myrtle Beach, South Carolina area. Elliott Beach Rentals is not affiliated with onsite management or the HOA of Sea Villas.